Shout out to seeing Coldplay in concert for having a small time Aussie ex-busker as their supporting artist. Jess Kent’s music definitely deserved the attention. 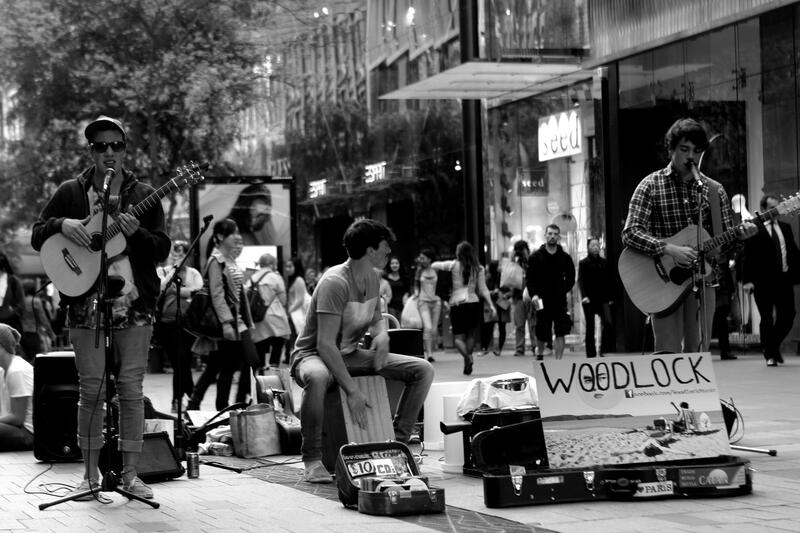 I went out to the city with some friends today and walked out onto Pitt St to find this wonderful band busking outside. They’re unsigned and honestly sound like should be. I don’t know if anyone thinks of this too, but I feel like you can hear the difference between a song by someone who isn’t that good at music (composition, instruments, performance) and a song by someone who should be (or already is) signed. I can hear their songs on triple j, at a music festival, their own gig, whatever. I always talk about how much I love finding new music from everywhere, so I bought their CD before they left. It’s actually kind of cute (haha!) because they don’t have an actual cover for it. It was burned onto those blank CDs that you buy in bulk at a supermarket, and they stamped on their website and the song list. But that’s kind of amazing when you think about it. Imagine, when that band goes large and people are paying to see them in festivals and concerts, you saw them when they were busking in the city and selling stamped CDs from the supermarket! Kind of like you were there when it all began. Every month, I update a playlist based on the month, and it’s usually a few hundred of my favourite and recently added songs. I do this because I have an 8GB iPod and I used to have to “uncheck” a song every time I added a new one, and it is a goddamn painstaking process! The songs aren’t necessarily new, they’re just newly added. I just wanted to share some of the music I listen to, because I love finding new music from other blogs and websites, so maybe someone can find new music from here!